With each new installation of Serviio you are granted a 15 day evaluation of Serviio Pro - an extended edition of your favourite media server. It has some nice features which the free edition lacks. After the evaluation period expires, it will revert back to the free edition automatically. To keep the Pro features, you will need to purchase the Pro edition license. If you are a first time user, try the evaluation version first before buying. To securely purchase the license, click on the Buy Now button below. You will be transfered to a Serviio store website where you will complete the transaction. Please note that the license gives you the Pro features for the currently released version and all minor updates. Currently you can you it for all 1.x versions. When version 2.x is available, you will need a new license file. The Pro edition licence is intended for personal use only. If you intend to use Serviio in a business environment, please contact us for more information. After successfully completing the transaction, you will receive a confirmation email as well as an email including link to download the license file. Download the file and keep it secure in a case you need to apply it again, for example after a Serviio re-install. To apply the license file to your Serviio server, open the Console. On the home screen, Click on the Upload License file button. You will be presented with another dialog box. 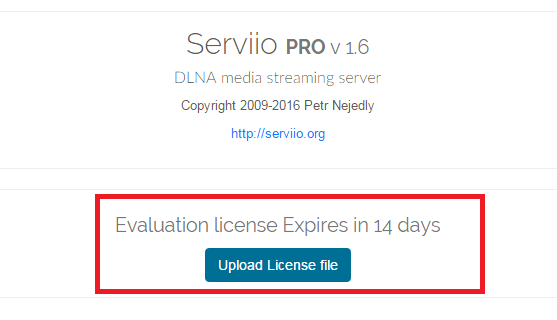 Click on Browse... and locate your Serviio Pro license file (it will have a .lic extension). Finally click on the Save button to apply the license file.